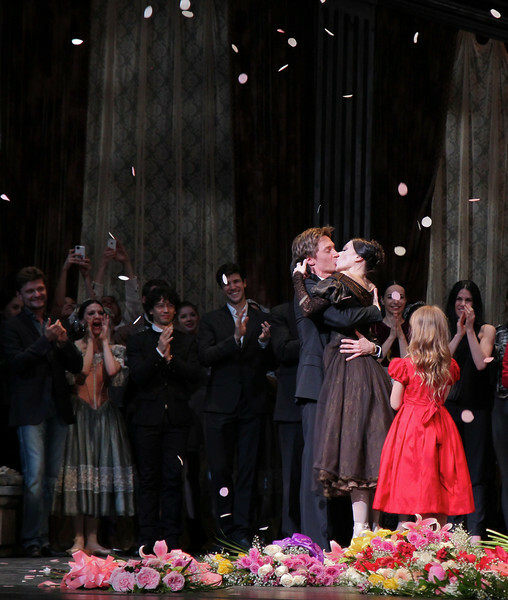 Irina embraces husband Max as daughter Emma looks on in the post performance celebration of Irina's final ABT performance. It was an honor to be at Irina’s final ABT performance, as Tatiana in Onegin. I always enjoyed watching Irina since she joined ABT in 1996, so it was sad to see her go. She was always expressive when dancing diverse roles-from a cocky, coquettish Kitri in Don Quixote to an anguished young lover in Romeo and Juliet. I enjoyed her great athleticism typified by a fouetté sequence in Don Quixote consisting of a series of alternating single and double fouettés with the double pirouettes capped by one arm en haut (arm above head) holding a Spanish fan. Her performances with husband Maxim Beloserovsky were memorable; you could see the great affection and bond between the two from the audience. Here are photos from Irina’s emotional post-performance goodbye. Plenty of hugs and tears as Irina is congratulated on a great ABT career by current and former dancers in addition to a well-deserved goodbye from her many adoring fans. I had an event in Philadelphia that weekend but wasn't going to miss Irina's final performance even if it meant taking the 3 am Amtrak train back to Philadelphia. Well worth the lack of sleep.